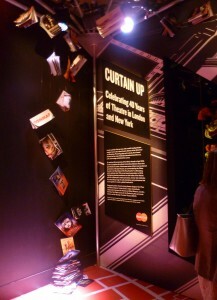 The V & A’s exciting new exhibition Curtain Up: Celebrating 40 Years of Theatre in London and New York celebrates the creative cross-fertilization between Broadway and London’s West End theatres since 1975. The exhibition rooms have been transformed into a backstage space, full of mysterious shadows and bright ever-changing lights in neon blues and reds. The V & A wants to entice you into a world which is larger, brighter and more glamorous than ordinary life. And, on this chilly February day, it’s more than welcome! Theatrical spectacle is all about creating the right effect: everything is bigger, bolder and more glitzy than in real life, and there’s nothing like seeing the actual costumes from big hits to be struck by their impact. 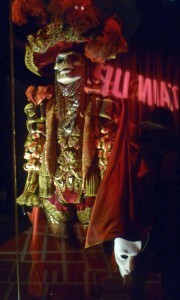 The exhibition opens with Michael Crawford’s stunning scarlet and gold suit for The Phantom of the Opera (1986), complete with the phantom’s skull-like head and white mask. Just seeing it close up hits you with an almost visceral shock: it’s a coup de theatre in itself. You realize that the costumes, set designs, lights, music and dance are all there to pull you into a strange and exotic world, one where you don’t know what’s going to happen. 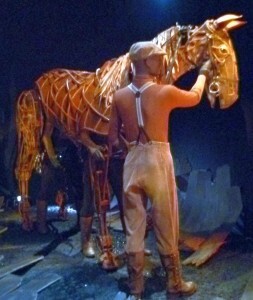 Turn around, and you are face to face with the original puppet for Joey, the Warhorse (2007). The lighting is deliberately low and it takes time for your eyes to adjust. Gradually, you notice that underneath Joey you can glimpse shadowy legs – those of the three puppeteers who control him. They have names: Hind, Heart and Head and it is Head whose skill allows Joey to come alive and express his emotions; his terror, courage and nobility. The exhibition also includes theatre costume designs (including for Wolf Hall), and models for various sets. 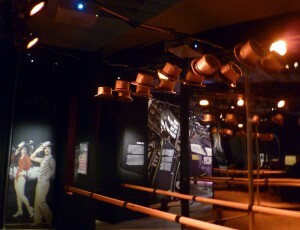 Posters, programmes (suspended on wires from the ceiling), and clips from numerous shows are everywhere – I particularly enjoyed watching A Chorus Line (1976) whilst standing under a brightly-lit row of the original silver top hats. 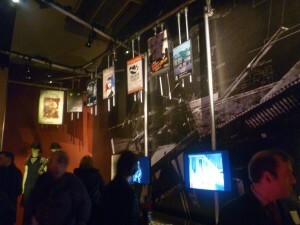 I saw the show itself when it came to London, and I have the LP (those were the days!) and my feet were tapping as I watched the film clip. I hope no-one heard me humming along! As I wandered round, I spotted a distinguished-looking man with silver-grey hair who held himself like a prince. 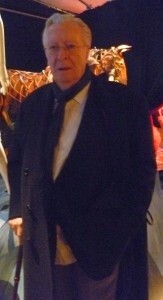 He wore an impeccably-tailored navy winter coat and held what looked like an ebony cane. We struck up a conversation. I said I wondered if he was someone I should know. He said, ‘I was a dancer in the original London production of Hello Dolly,’ and added modestly, ‘I’m not famous.’ I said, ‘But, if you will allow me to say so, you have real presence.’ ‘A dancer’s training,’ he replied with a smile. We spoke for a few minutes and I said that I’d like to mention our meeting in this post. So, with his permission, I took his photo, thanked him for talking to me and we parted. I thoroughly enjoyed my visit to this life-enhancing exhibition which exudes glamour in spades. It is on until 31st August, after which, it transfers to New York. It is also free! I saw Warhorse at the Lincoln Centre in New York. I thought the puppets were just amazing. It was a very emotional play – I cried. It is as one of the highlights of my time n new York. Thank you for your comment, Janet. The warhorse was terrific close to, as well. But it was perhaps just as well that you could only see it in the theatrical half-light!